From the delightful folks who brought us the adorable upcycled kitty cat crayons, comes a crayon holder fit for colorful kitties – the Kitty Bus. Each cat bus is handmade with real pine wood, sanded smooth and has real working wheels. The bus features 3 seats on the top that perfectly fit the cute Kitty Egg Crayons as well as other small toys. If you like, you may attach a string to the bus to turn it into a pull-toy. The little bus is finished with natural wholesome beeswax to bring out the natural wood grain beauty, so note that all buses will have slight variations in grain and size due to their handmade nature. Crayons are not included, but you can pick some of those up at their shop when you get your bus. From the delightful folks who brought us the adorable upcycled kitty cat crayons, comes a crayon holder fit for colorful kitties - the Kitty Bus. 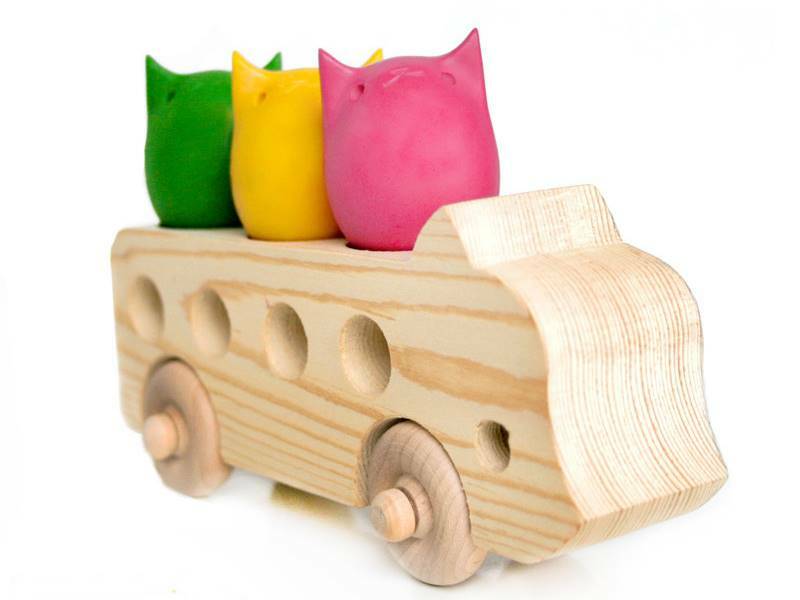 Each cat bus is handmade with real pine wood, sanded smooth and has real working wheels. The bus features 3 seats on the top that perfectly fit the cute Kitty Egg Crayons as well as other small toys. If you like, you may attach a string to the bus to turn it into a pull-toy. The little bus is finished with natural wholesome beeswax to bring out the natural wood grain beauty, so note that all buses will have slight variations in grain and size due to their handmade nature. Crayons are not included, but you can pick some of those up at their shop when you get your bus.